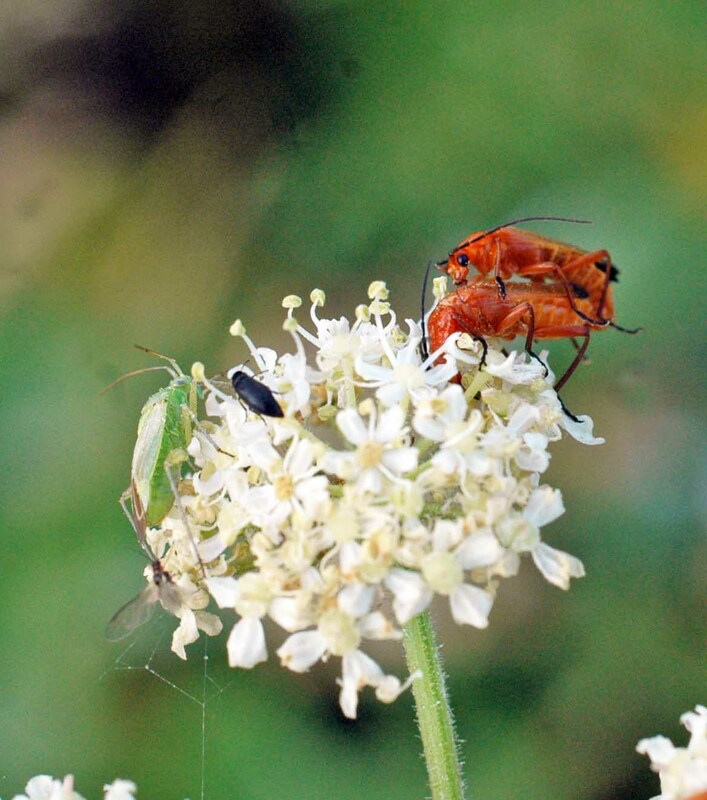 The most significant nectar provider for a whole host of insects at the moment is Hogweed, or Cow Parsnip if you prefer. In common with many species of wildflowers it seems to be having a bumper season and is flowering profusely in a lot of locations. The photographs here were mostly taken in the last couple of weeks, either in the Rhiwledyn Nature Reserve on the Little Orme or on Bryn Euryn. 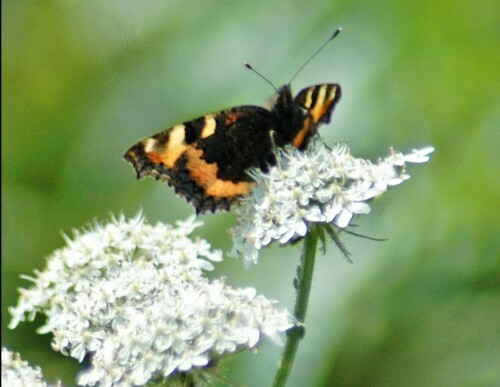 Family: Carrot; Umbelliferae Habitat: Rough grassland verges, light woodland. The most usual late autumn umbellifer in flower. Hogweed is an herbaceous perennial or sometimes biennial plant, native to Europe and Asia. 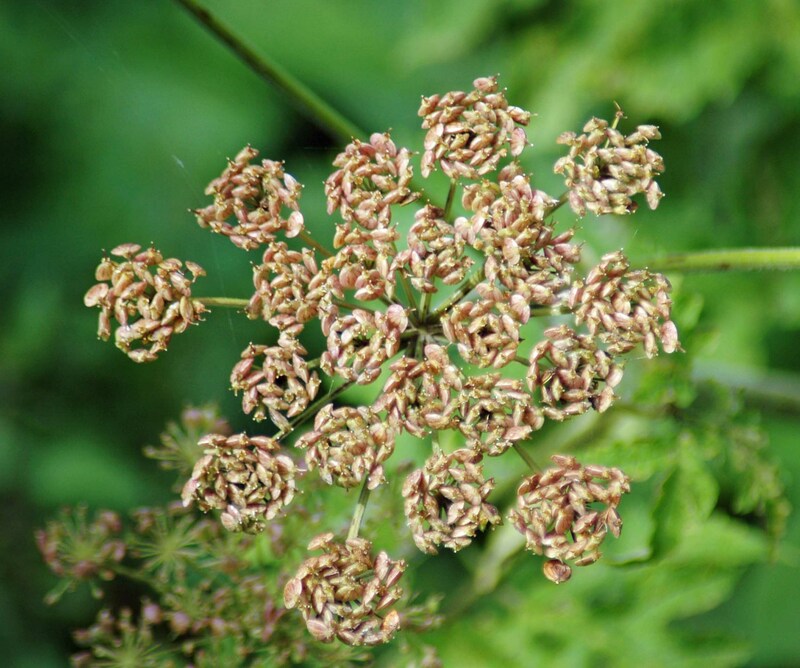 It is an umbelliferous plant, in the same group as plants such as fennel, cow parsley and ground elder. 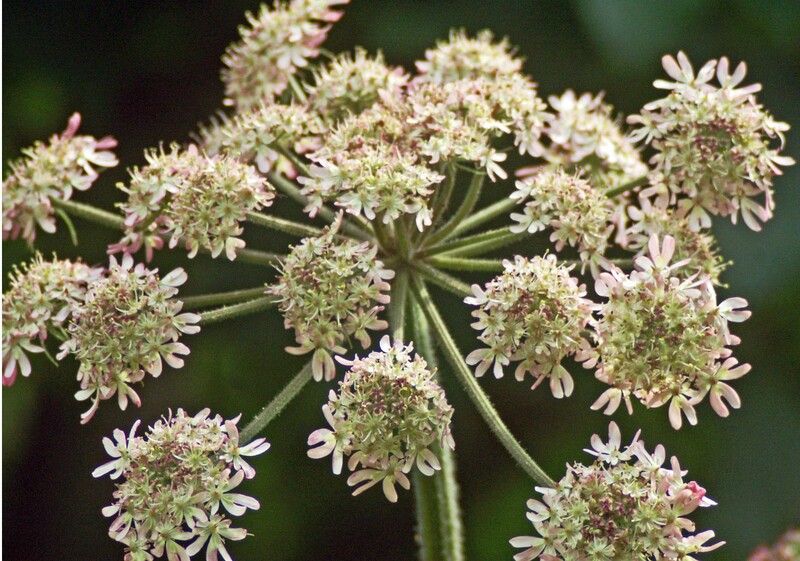 The common name of Hogweed refers to the characteristic pig-like smell of the flowers. The genus name Heracleum derives from the Greek “herákleion” and refers to the mythologic hero Heracles, who is reputed to have used the plant medicinally. The species name sphondylium, meaning “vertebrae”, refers to the shape of the segmented stem. 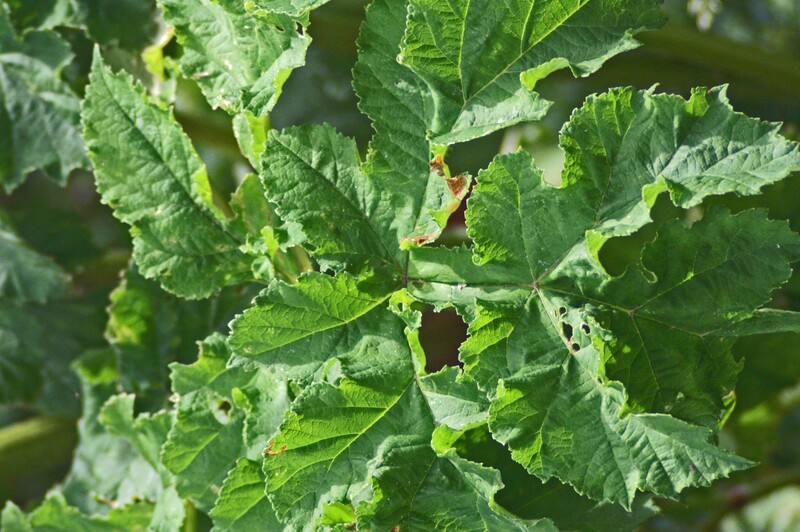 The leaves are large and can reach 50 cms (20 in) in length. They are pinnate, hairy and serrated, divided into 3-5 lobed segments. The roots of the plant are large, rhizomatous and reddish in colour. The stem is hollow and striated with bristly hairs. The flowers are white, sometimes pinkish and each has 5 petals. They are arranged in large umbels of up to 20 cm of diameter with 15 to 30 rays. The peripheral flowers having a radial symmetry. 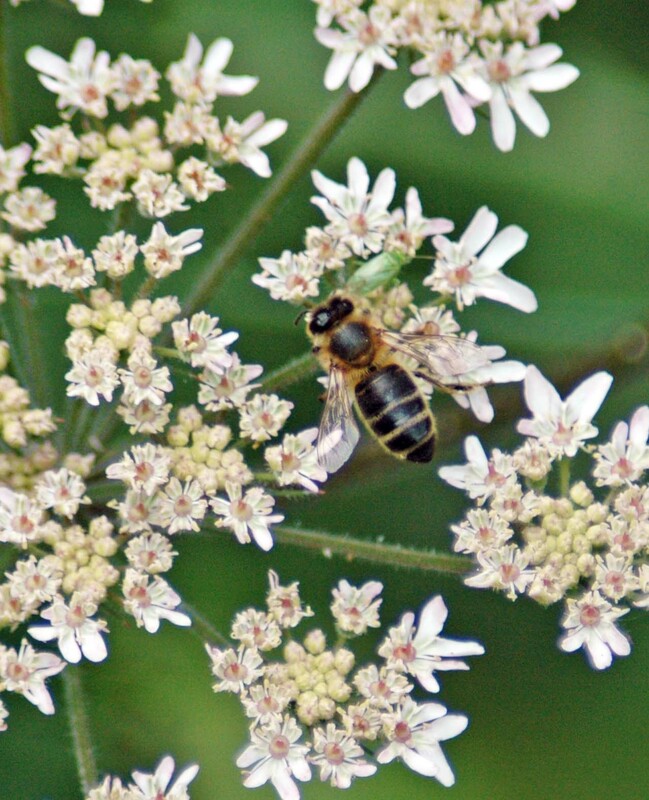 The hogweed is one of a number of plants that have foregone the use of a sweet scent to attract pollinating insects. 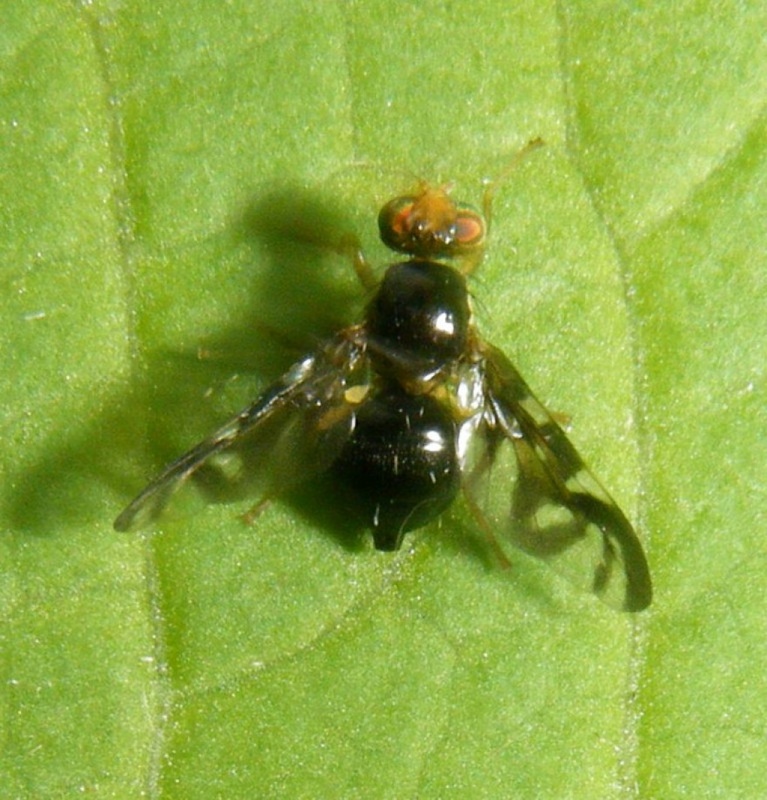 The plant has adopted the more unusual strategy of mimicking the scent of pigs, not that noticeable to us, but to flies it is like a magnet and flies are the main pollinators of this plant. The small fruits are flattened and winged, elliptical to rounded in shape and glabrous (smooth, free from hair or down) up to 1 cm long. The seed dispersal is by wind. 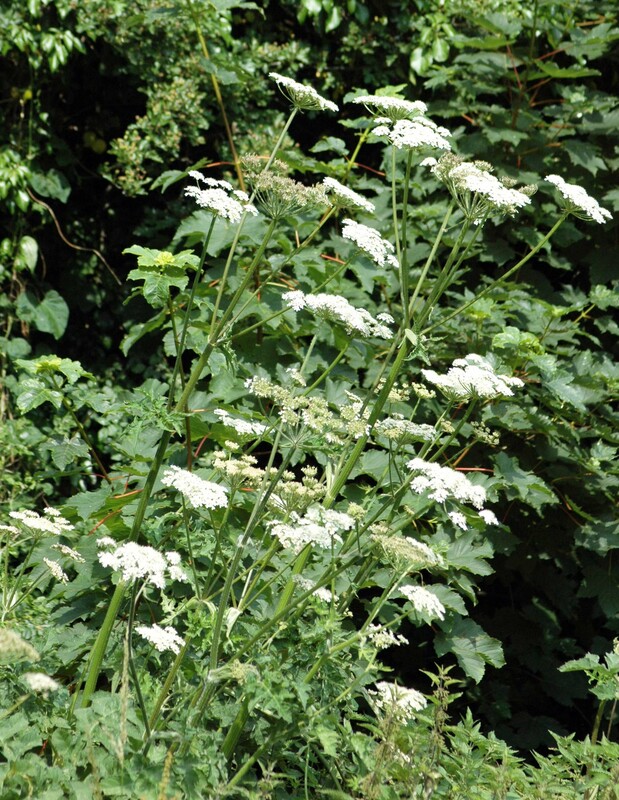 Common hogweed was once employed in medicine, although its use has been long out of favour. 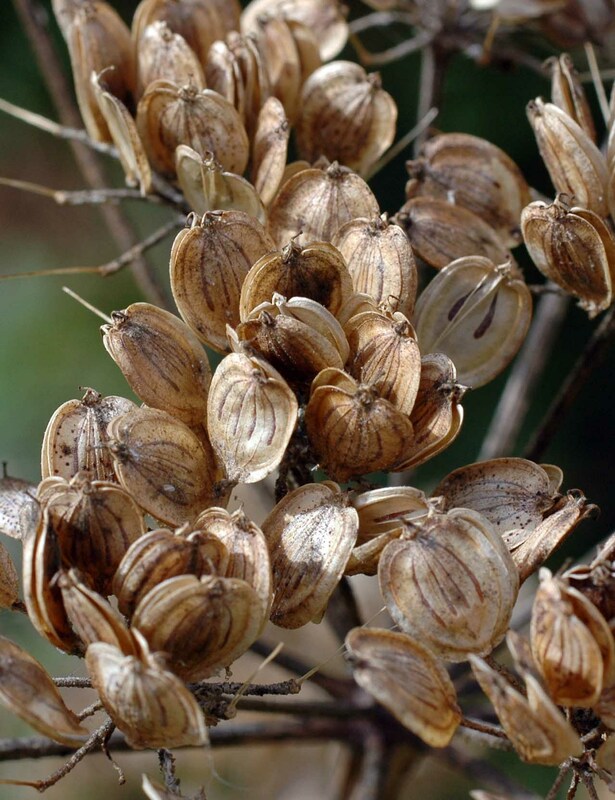 Long ago the seeds were boiled in oil that was then recommended for application to running sores and to treat the rash associated with shingles. Culpeper recommended a decoction of the seeds to be applied to running ears. Hogweed shoots have a high vitamin C content and the plant is still eaten in some places. The young shoots are collected early in the season and the tender young stems, cut into pieces about 15cm long may be boiled in salted water for about 15 minutes, then drained and served with butter. Apparently they make an ideal accompaniment to meat dishes. Although its main pollinators are flies, many insects of other species can be seen helping them out whilst helping themselves to the nectar. 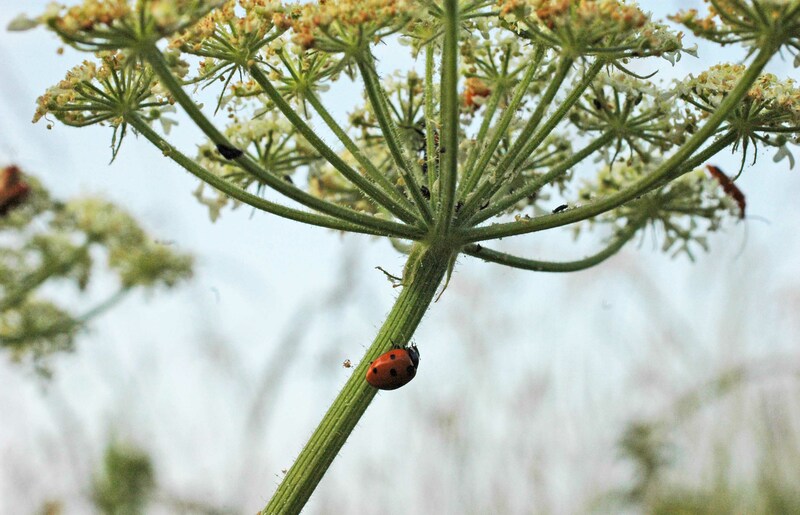 It is not uncommon to see numbers of insects vying for a space on the same hogweed flowerhead. 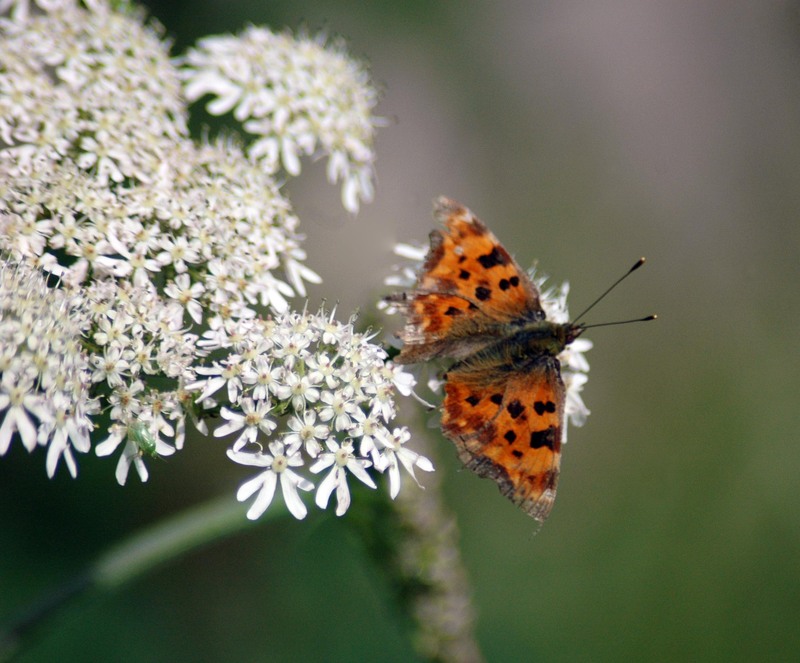 At Bryn Euryn the first insect I spotted on Hogweed flowers was a Comma butterfly. It was looking a bit worse for wear, faded and with chunks missing from its wings,but is a first tick for a sighting of this species this year. 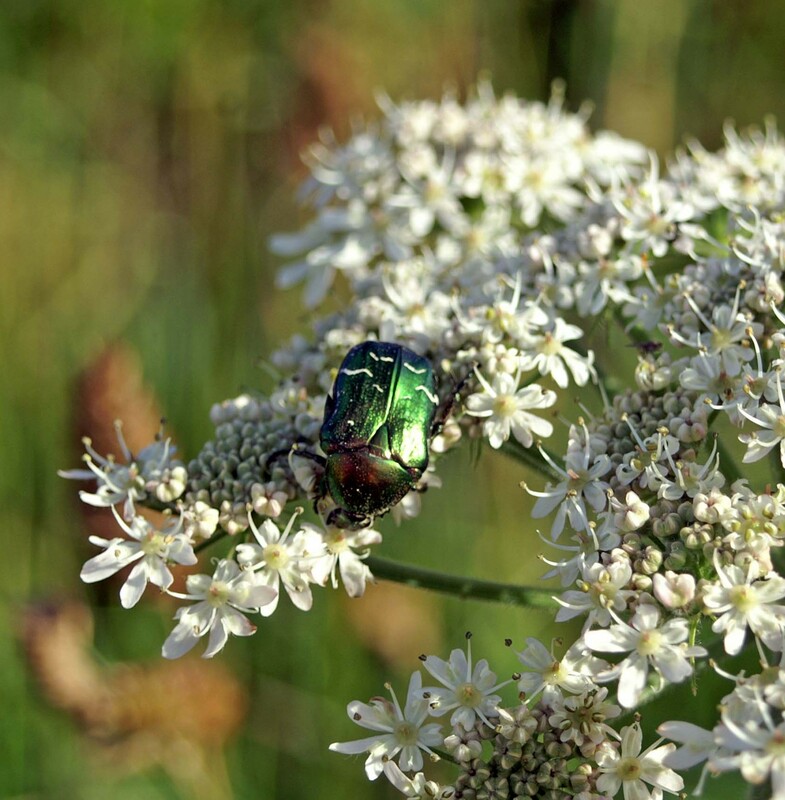 One of my favourite photographs of an insect on hogweed is this one of a Rose Chafer, taken somewhere along the Pembrokeshire Coastal Path. Thank you for the re-blog, I’m pleased you found the post interesting. Hogweed is proving to be a magnet for so many insects at the moment, not sure if it’s because there’s not a lot else- thistles and knapweed not quite there yet. I’ve got more images to add to the list of insects recently seen nectaring on the plant too, some I’ve not seen before. 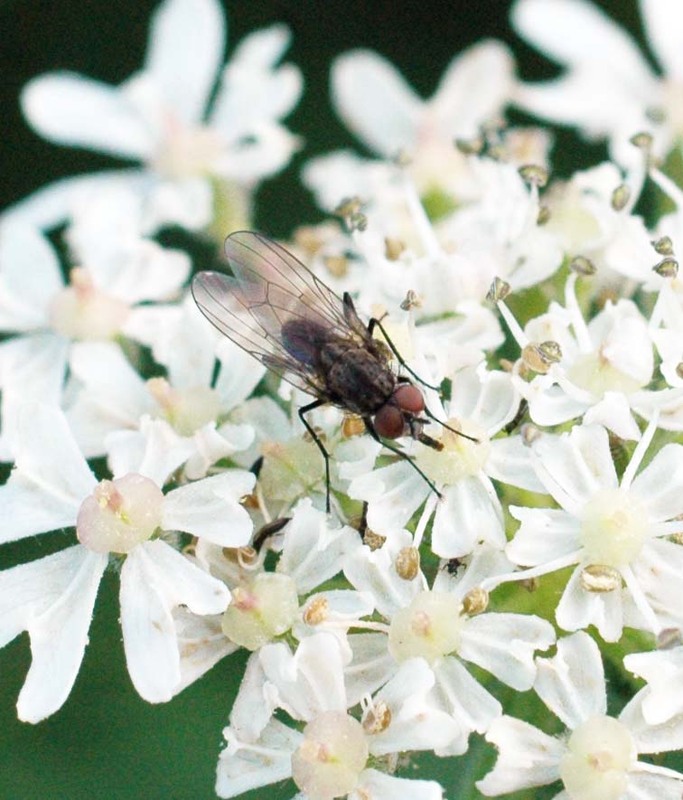 Hogweed – a great nectar source. Thank you for looking at the post! What you’re seeing is more than likely to be hogweed – it’s very common & widespread, which is probably why we don’t pay more attention to it. 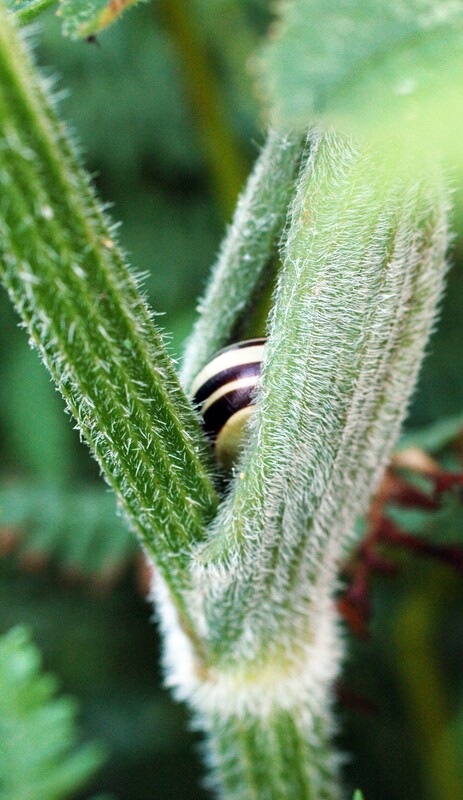 Looking more closely at it is often interesting – all sorts of interesting little creatures visit its flowers. I’m going to pay more attention now, I’m pretty sure I’m seeing this on my daily walk, but didn’t know what it was. Thank you. I think its a common plant to most areas but as its not particularly beautiful we don’t take too much notice of it. I loved the bit in your post about honey bees not getting much value from it, I didn’t know that and meant to quote you. I will go back and do that. 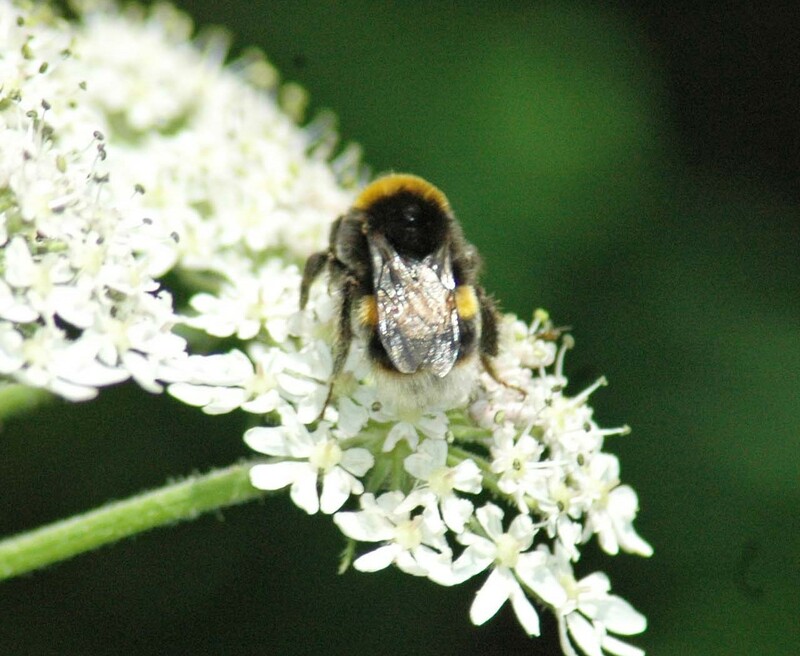 Thanks – bear in mind that’s only based on my observations in one particular area though, I have seen honey bees on it occasionally and it may be that in some areas it’s more important to them if not much else is around to forage on. Thanks for the info, this is a common plant round my area and it’s good to know more about it. I often see bees and flies on it, had no idea it smelt like pigs though! Intriguing. Great post as ever! Good website recommendation too, very useful. 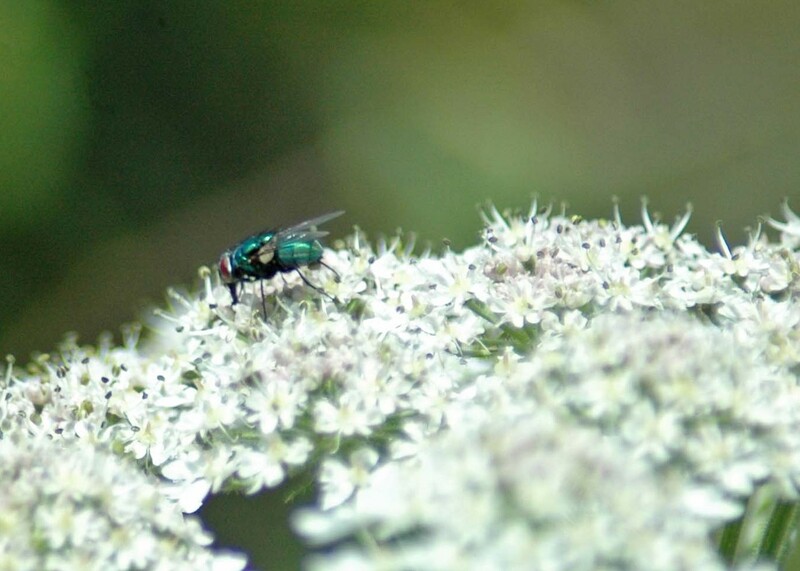 Thank you Maggie, I’ll keep adding to this post as I spot more hogweed visitors, it is not the most beautiful, but has to be one of the most bountiful of the summer flowers. I find the naturespot website really useful and very user-friendly. I’m not great at heat – I used to escape here from Spain for the summer, but don’t begrudge it to everyone else!